AB both tight-fitting. 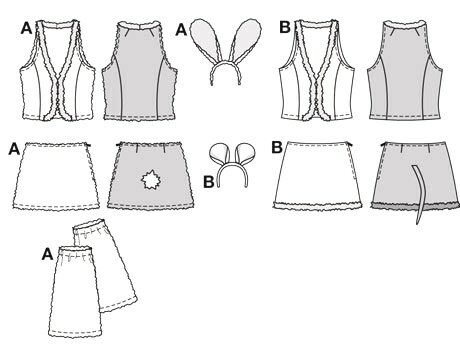 Cheeky, flared, hipster mini-skirt, each with the matching appropriate little tail added. Team with a slinky waistcoat/vest with cut-away shoulders and fake-fur trim. Don’t forget the cute head-bands with suitable ears! Matching accessories: leg-warmers A or arm-warmers for B.